The people who work the front desk were amazing!! The 1st room we were in ,the bed was so slanted that after one night we asked for an extra pillow to prop the bed to even it out and they ended up switching us to a different room, it was a bit larger (we had space to walk around the bed in room 2, lol) but the bed wasn't so comfortable, it was really hard. I'm confident if we had made that known they would've switched us again but we didn't mention it because we were only there for 3 more days. There was a hot water machine & instant coffee & the most awesome cookies in the room, no cleaning services but you could exchange towels everyday yourself for new ones which was nice. The apt's are very small, the showers are tiny but all in allow we really enjoyed our very affordable stay! The reception guys were just so great, they really made it a pleasant experience & I would stay there again strictly because of them! Good location in central london. Quiet location in London. We absolutely loved the location of Studios 2 Let. It is a small studio, but provided us with everything that we needed. The staff was very friendly and helpful. We were close to the King's Cross St. Pancras station which made travel to anywhere in the city very convenient. Options for pubs and cute food places nearby. Also a shopping center within walking distance. If you dont require alot of space and want something close to everything this place is great. My only real complaint is my bed was lumpy and the matress should be replaced and one of the night staff was rude hell both time I needed help from him. Everyone else were an absolute delight. The housekeepers are friendly and do an amazing job. I would go back again but would request a new room if I got the same room with the same matress.. The travelers should be aware that apartments are tiny but cozy and do not have air conditioners. The building does not have an elevator, but the staff helps with baggage. The apartments have all that you may need for your stay. Location is just excellent, close to three underground and one rail stations, restaurants and supermarket. Love this place! First room I had was a budget studio and now I’m in a standard studio. The budget was small for 2 people specially when one is the unite messy. The standard one is perfect. The only thing I wish for is that they had an elevator to the top floor. It’s hard carrying bags so many flights but they did offer help and I’m hoping they’ll have someone help us again when we live. Too close for two persons who are just friends. Bed tight against the wall - not easy for two people to try to use. Always passing each other sideways because of tight fit. Friendly staffs and nice equipments ! Nice overall ! You can hear everything through the wall and the windows. The flats were great, cute, comfortable and in a very convenient location close to the train station, tube and places to eat. Shower was s tad on the small side, but that's to be expected for a small flat. Great stay! Location was close to underground and places of interesting such as The British Museum and The British Library. We had opportunity to save money because we had complete set on our kitchen and shop where we could buy not expensive food.The place was quite, but on the same time it was not far to small restaurants and pubs. Staff was friendly and polite. They helped us with everything what we asked. The room was clean, but bathroom was too small for us. We hardly could squeeze ourselves into. We could recommend the hotel for young people who do not care too much about luxury. Was surprised when we arrived at our room. It was very small the bathroom was so small that the cruise ship bathroom is bigger. I don’t really know what their policy is but we didn’t have any housekeeping for three days, no extra toilet papers, our trash was full and we don’t know where to throw them nor anyone came to pick it up! Beware it is a studio so no food / restaurant within the facility. the ease of getting to the studios was very convenient two blocks from the tube station. we came right from heathrow to the station and walked. the overall studio was beautiful. Yes people small by american standards but it's bigger than a cruise ship cabin. Hotel is a series of buildings on a quiet street across from a park/tennis courts. Our unit was on top floor (3rd) with no lift. For those with large luggage, this could be a problem. Room was small but adequate and clean. Nice view of the park. Bathroom was small but functional. We used the small kitchen for breakfast and dinner. So, this hotel is in King's Cross, one of our favorite hip areas of London, and thus an easy short walk to buses and the Tube, which is mainly why we booked it. But it turned out even better than we hoped, from the happy greeting from the guys at the desk to the lovely (if a little small) room (but this is London, after all!) with a charming little leafy green patio/garden, perfect for lunch or drinks and canapes (which we did often). It is on a lovely, quiet street, and the price was excellent compared to all that is available in the city. We would certainly come back here again. We loved staying here! We stayed a total of 6 nights in 2 different rooms (we went to the continent for the weekend) and enjoyed every night and both rooms. We were centrally located to multiple tube lines and train stations-in addition to being able to walk much of London. It was very clean, and the free laundry facilities were so wonderful to make use of. Plenty of grocers and cafes nearby for anything you could need. The front desk associates were not especially warm and friendly, and the lady that worked there was somewhat overwhelming, but they were typically accommodating. Coming from the U.S., a downside would be that most European hotels and bathrooms are small to us-and this hotel is no exception to that. That is really splitting hairs though. Comfy, clean beds and charming interiors, plus the added bonus of a kitchenette made this a wonderful place to stay. Quiet, safe neighborhood. Convenient to public transportation, grocery stores, restaurants. Mini kitchen in room. Good choice for an extended stay. 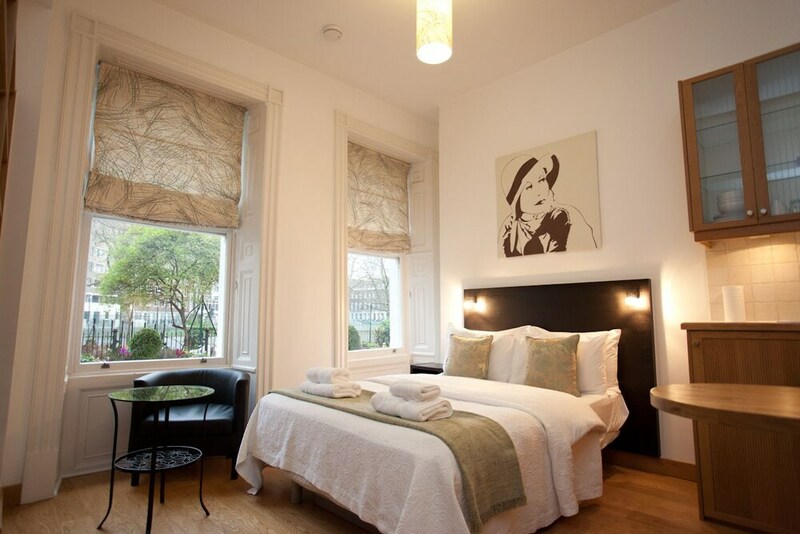 Located in London City Centre, Studios 2 Let Serviced Apartments - Cartwright Gardens is adjacent to British Library and within a 10-minute walk of other popular attractions like University of London. Each of the 144 rooms at this 3.5-star apartment building includes a microwave, an electric kettle, and an LCD TV. Each apartment has an array of amenities, including a microwave, an electric kettle, and a safe. Guests can expect to find free WiFi and 27-inch an LCD TV with satellite channels. Beds sport premium bedding and the bathroom offers a hair dryer and free toiletries. Limited housekeeping is available. Guests of Studios 2 Let Serviced Apartments - Cartwright Gardens enjoy free WiFi in public areas, a meeting room, and express check-out. Multilingual staff at the 24-hour front desk can assist with luggage storage, dry cleaning/laundry, and tours or tickets. Other amenities at this adults-only apartment building include a terrace, laundry facilities, and a porter/bellhop. Thank you Julieta, we appreciate your comment. The preferred airport is London (LHR-Heathrow).